The North Carolina Kayak Fishing Association held the Oak Island Classic Kayak Fishing Tournament at Oak Island on Saturday and besides the usual redfish, trout and flounder divisions, it also included a king mackerel division. Four of the participants reported battling kings, but only one was boated. 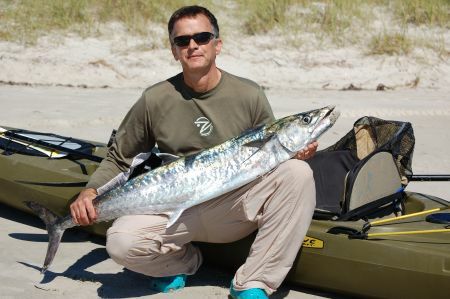 Congratulations are in order for Kirk Talbert who landed a 45 1/2 inch king from his kayak on Saturday and won the king mackerel division. This is definitely a first for N.C. and may be a first for the entire country.